Is there a better way to ring in the new year than with your Recommended Daily Dose of SWAYZE?! I submit there is not! James Dalton (Swayze) is the best cooler in the business. What's a cooler? Basically he's the head bouncer. And a little hole in the wall in Jasper, Missouri called the "Double Deuce" needs some serious bouncing. So the owner lures Dalton to his place with a hefty salary. His influence immediately helps, but there's more than just rowdy customers to deal with in this corner of Missouri. The real problem in Jasper is Mr. Brad Wesley (Gazarra), the richest and most feared man in town. He owns a piece of every business in town, and he sees Dalton not only as a threat to his enormous ego, but to his all-encompassing grip of terror on this sleepy little country berg. But Dalton seems content to just stick to his cooler-duties and continue exploring the depths of his inner peace. Because, naturally, there's more to Dalton than meets the eye. There's an introspective and intelligent mind ticking away underneath that perfectly coifed and hair-sprayed head of hair that he owns. He does Tai Chi (shirtless) and reads books (also, often shirtless). He might be caving hicks' faces in on a nightly basis, but he's got a degree in philosophy from NYU, so you know he doesn't enjoy it. It's just a job. Never personal. That being said, you KNOW it's going to GET personal.. don't you? Well, it does. Dalton starts to form bonds with the townsfolk, and even becomes involved with a local emergency room doctor, Elizabeth Clay (Lynch). What could the Doc possibly see in a brawler like Dalton? Well, besides an obvious shared addiction to Aqua Net, the Doc is fascinated by the WEB of contradictions that IS Dalton. It isn't long before they both get shirtless and start doing some horizontal Tai Chi. But the bliss doesn't last for long. Besides the fact that Dr. Clay used to be "his gal", Brad Wesley sees the people of Jasper starting to gain a little confidence behind Dalton. So he decides to show them what real power is. Wesley and his team of goons, led by the almost cockatoo-headed Jimmy (Marshall Teague), start tearing the town apart. They burn down the auto parts store next to the Double Deuce and drive a monster truck through the local car dealership just to show them all who's boss. Dalton soon realizes that he might be in over his head (as monster truck-sightings often do), so he puts in a call for help to his cooling-mentor, Wade Garrett (Elliott). Wade isn't as young or cultured as Dalton, but he's tough as nails and willing to stand with his 'migo 'til the bitter end! So, the stage is set for a showdown. Will Dalton and Wade save the town? Or will Brad Wesley's reign of terror continue? It's Dalton's World, and you're all just living in it. 1.Never underestimate your opponent. Expect the unexpected. 2.Take it outside. Never start anything inside the bar unless it's absolutely necessary. and 3. Be nice. For those of you who haven't seen a bar brawl, it's not a pretty sight. It's a very violent affair, more wrestling than anything else, and this tornado of carnage is over and out the door in almost no time at all. The bouncers try to stop it and get the combatants outside as quickly as possible. The reality of bar fights is this: They don't lend themselves to an action movie in their "real" state. Would you pay money to see Patrick Swayze in a dog pile of people that rolls out the front door in under 30 seconds? Of course not! So while Dalton's rules for taking care of bar brawls might apply in the real world of bouncing, in movie reality they're useless. It's a highly choreographed affair at the Double Deuce! Everyone pairs off and you're more likely to catch a roundhouse kick in the face from Dalton (no small feat, considering his mind-bogglingly tight jeans) than a beer bottle over the head (but don't worry... the good ol' "beer bottle conk" is still alive and well in this film). "Taking it outside" might be the prudent course of action, but there's no pool cues with which to fight with in the great outdoors! So the action stays decidedly indoors for the most part. Is it realistic? No. But is it fun to watch? Absolutely! I'm not going to try and convince you all that this is a great movie; this isn't "Citizen Kane". I'm not that blind to the obvious faults of this particular cinematic presentation. But, as guilty pleasures go, this is a fairly harmless one. Some people like to smoke cigarettes. Others enjoy a sip of booze now and then. I enjoy the acting talents of Patrick Swayze with a relatively clear conscience and a minimal amount of damage to my lungs and kidneys. 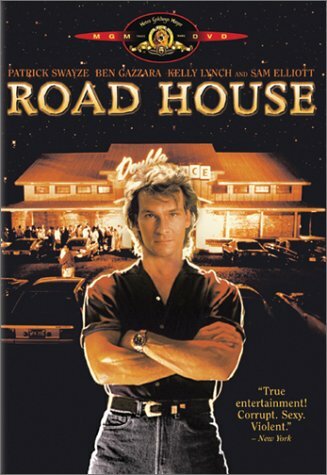 And "Road House" is a perfect vehicle for Mr. Swayze's brand of homespun adages, like, "I want you to be nice until it's time to not be nice." or "Take the biggest guy in the world, shatter his knee and he'll drop like a stone." I think those are words we can all live by.